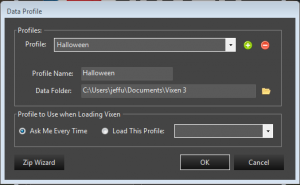 Vixen supports creating multiple profiles so that you can have different setups. One example of this is to allow for a Halloween setup in addition to a Christmas setup, where your elements and display setup are different. I also use it to manage multiple sites so they can be configured independently and keep this size of a profile to a reasonable size. The Profile setup can be accessed from the main administration page under System -> Profiles. Here you can add or delete profiles. Using the green plus button will add a new profile. The default folder is placed in your My Documents folder and is based on the name you give the profile. If yo want to delete a profile you can select it in the drop down and click the red minus button. This will remove the profile from showing up in Vixen, but it will not actually delete the contents on your hard drive. You will need to manually remove it if you want to. This helps prevent accidental removal of a profile. You can also map to an existing profile that someone has shared with you. Copy their profile under your My Documents folder being careful not to overwrite any of your other profiles. Many people share their default profile which is named Vixen 3. But you will want to extract that to a temp location and rename it before copying to your My Documents so you do not overwrite your main profile. Once you have it copied in, you can create a new profile and navigate the data folder to point to it. At the bottom of the form are options to manage how profiles are loaded. 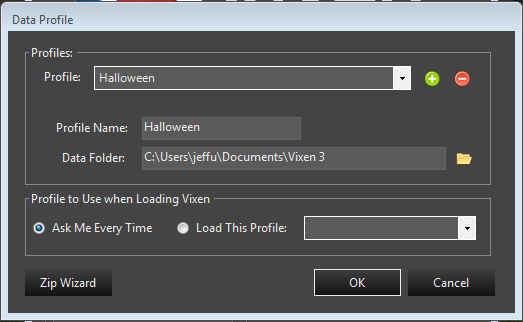 You can select a default profile to always load when Vixen starts up, or have it prompt you to pick one every time. Keep in mind that if you want to switch profiles often, the ask me overtime is the best choice. To change profiles, you need to exit Vixen and restart it with the option to ask you so you can select the profile you want to load. Lastly at the bottom is a link to the profile zip wizard where you can create a zip copy of your profile for sharing or backup. See the section on the Zip Wizard for more details.